The Reluctant Baller (RB) was thrilled when we arrived, a little late, to find his sudden-darling Spartans up early over the Blue Devils. Four early three-pointers got, not-quite-immediately, Duke’s attention; Coach K later said that in the opening moments, MSU had “punched us in the face”. (I found it oddly cute, and only momentarily depressing, that the Corporate K felt it necessary to hastily append “not literally, of course!” to his street-fighter reference. We got that it was a scrappy, colourful metaphor, coach.) The 14-6 lead, as the D in Duke began to assert itself, quickly became a tie at 16 and an 11-point halftime deficit. Sigh. Another missed opp for the Reluctant Baller to get excited about the game. Underdogs and upsets and Cinderella fanboys all got short-sheeted: Tom Izzo teams don’t quit, but they were clearly overmatched at forward as Jahlil Okafor and Justise Winslow dominated for 37 points between them. Guard-happy guy that I am, though, I was beginning to notice how good Duke’s freshman pointer, Tyus Jones, is and will be, and then there was this other rook, Grayson Allen. 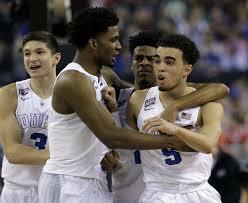 Four thin young Dukes: Grayson Allen’s adorable face, Justise Winslow, and Tyus Jones, all freshmen alongside Okafor. In the background, an actual *senior*, Quinn Cook. Could anybody look more like the poster-boy for all that Duke-haters like to revile? First of all, like nearly all the college hoopsters that alleged fans love to mock and spew venom about, Allen’s a white kid. (From Laettner to Redick to Wojo to Scheyer, they nearly always are. It’s an odd thing, and a case of reverse-racial-profiling that nobody seems to question or comment on. I do, and will.) And even I can admit that he has what Grantland’s Mark Titus is sure to call “Grayson Allen’s punchable face”. I have no idea of his background, but a casting director looking for a spoiled, uber-rich and ultra-entitled fratboy face can stop looking. Yes, and his name is Grayson. But after spending much of the year buried behind other Duke guards, the kid was great against the Spartans (and even greater in the final). Belying his looks, he was scrappy, diving for loose balls, tough, hitting big shots, and bad, throwing down a vicious tomahawk dunk and hulking out a little, too. (But they’re gonna hate this kid everywhere but in Krzyzewskiville. It’s inevitable.) When Allen buried that shot off his own miss – follow your shots, guys! – it was 50-31 and the Spartans were playing mainly for respect. Earned, say I, though the final was emphatically Durham-friendly, as the Dookies won 81-61. We have lift-off. It was worth two points, but Allen’s flush against the Spartans felt like the end. One game was enough for my RB son, which is why he missed one of the most compelling college ballgames you’d ever want to see. Duke versus Michigan State, by my count, was a tale of two talent-levels: the Blue Devils have four substantial NBA futures (Okafor, Winslow, Jones, Allen) to two – maybe – for the Spartans in Denzel Valentine and a cup’o’coffee each for Travis Trice and Branden Dawson. Kentucky against Wisconsin was an even more dramatic contrast: the Calipari Way (convince packs of prime NBA-calibre hounds to spend one year schooling each other in Lexington, a method Saint Michael of Durham was not above — and capable of — copying, especially this freshman-dominated season¹) versus Old School Bo (Coach Ryan and his stubborn development of less-precocious players over four possibly-even-educational school years). ¹ “Two can play that game,” Krzyzewski must have muttered to himself as Calipari’s one-year ‘program’ came to dominate the last few years, but actually it’s not just Durham, North Carolina and Lexington, Kentucky that are blue-chip talent magnets. Bill Self at Kansas, Roy Williams at North Carolina, and maybe Billy Donovan at Florida try to play in the same league. (Jim Boeheim and Syracuse used to compete there, too, until the latest sordid tale of ‘student athletes’ wrecked the pipeline shipping hops, wingspan, handles and jumpshots to upstate New York.) Coach K had Kyrie Irving for part of a year, don’t forget, and he went and found three “one and done”-ers to at least match Calipari’s recruiting haul last season. (He now has the nation’s top freshman class again next year, including a starry kid poached from rival Tarheel country. DukeHaters won’t want for anything in the foreseeable future.) The irony is reaching Red Alert status: Duke is one of the most prestigious academic universities in America, but its most famous students don’t graduate much anymore. Aaron the point guard on the left, Andrew the long-range gunner right. I’m pretty sure. Each stayed *two* years in Lexington. Solid NBA guys, I think; too slow to be stars? The Pro Score? Kentucky has, what, seven future NBA-ers? It’s apparently Karl-Anthony Towns or Duke’s Okafor for the number one draft pick this June, to be followed in some order, and likely this year, by the Harrison twins, Willie Cauley-Stein, Trey (yes, he’s Canadian) Lyles, and surely somebody will give a lengthy, nimble-footed kid like Dakari Jones a try even if his skills are marginal. Wisconsin’s late-blooming Player of the Year Frank Kaminsky – no McDonald’s high school All-American, he – and Sam Dekker are the complete list, from what I’ve seen, of NBA-Bound Badgers. 38-1. That was Kentucky’s record following their loss to Wisconsin, and that will be a much-recalled stat-bit, as is the New England Patriots’ 19-1 2007-2008 season, in which they famously ripped through their regular and post-season schedules undefeated and barely challenged, but then were upset by an underwhelming New York Giants team in Super Bowl XLII. Wisconsin, evidently, had not received the Kentucky is awesomely unbeatable and unbeatably awesome memo; having lost close to the Wildcats in the previous year’s Final Four, they weren’t just a veteran squad but a confident and highly motivated one. KU’s uber-athletic and deep roster ran out to an early dunk-infested lead, but Wisconsin runs gorgeous offensive sets and defends well. The first half was compelling, and solved nothing: it was tied at 32. The unbeatens are no more. Badgers can dance. Thrill. Quiet agony as Cauley-Stein walks away. It’s still not clear whether Kaminsky can guard anybody at the NBA level, but he is a fascinating combination of old-school post-play – sweet hands, precise and multi-faceted footwork – and the post-modern Nowitzkiesque capacity of a giant man to shoot straight from long-distance. He more than held his own against Kentucky’s long-armed brigade of post players, even defensively at times. (There’s a GIF of him magically picking Okafor’s pocket in the title game; it looks like a set play in which Okafor makes a handoff to his defender, but Kaminsky anticipated his post move, ripped the ball loose, spun and fired an outlet pass before the Duke man-child quite realized what had happened to him.) Dekker, too, comes with pro question marks – few don’t, actually, given the magnitude of the jump from college to the NBA – but he slayed the ‘Cats with absurdly confident end-of-shot-clock strokes from deep. Towns, meanwhile, will clearly be a close-to-the-basket force (though not right away) in the NBA, but it was Aaron (the point-guard twin, as opposed to Andrew, the mad gunner from last year’s deep Kentucky run) Harrison who impressed and kept Kentucky hanging in against the Badgers. It’s a game to watch again, and Wisconsin’s final 71-64 spread, late free-throw-inflated, belied the intrigue and tightness of the match. It was fun, even watching by myself. Monday, April 6. (Jesus Lives.) Duke Wins. It was disconcerting to watch Bo Ryan, the Badgers’ coach, going as far as I’ve seen big-time coaches go in post-game bitterness. He didn’t flail or swear and came across as quite sane, but he wasn’t as gracious in defeat as talking head Greg Gumbel claimed in a cliched, pre-cooked, made-for-TV summary. Ryan didn’t name names, but he pointed fingers. Wisconsin has been my favourite story in the past two seasons, helped by two things. First, on a summer trip north in 2013, the Badgers got beat by my city’s obscure and astounding basketball dynasty, the Carleton Ravens. Two straight Final Fours for essentially that same club was exciting to see, as our hometown David had slain that American giant. Second, possibly even more impressive – Carleton beats or scares the pants off NCAA powers on their off-season summer tours pretty regularly these days – was how respectful and open Ryan and other Badger commentators were about the Ravens, even going so far as to credit the pace-and-space nature of CU’s unrelenting attack for helping Wisconsin to hit its collective stride as a national power. Such humility – a nod to a Canadian team in the forging of a Final Four season?! – was rare and impressive, but still, as the game wore on, I realized that old Blue Devil affections were taking over. So when Ryan complained about the over-physicality of the game, implicitly blaming Duke thuggery and official incompetence for his team’s loss, it tasted to me like sour deep-purple gripes. Scores? 31 all at half, and the final tally was 68-63 for my nearly-beloved Dookies. (Perhaps, after all these years, the thrill is, well, not gone exactly but pleasingly tamed.) Big Frank was great again in defeat, with 21 and 12, and I’ll be pulling for finesse and skill to know success and kill at the next level. Tyus Jones (23) and Grayson Allen (16) are two freshman guards who made the difference. Guards win in the NCAAs, and in some ways Wisconsin’s success is all the more amazing considering how moderately gifted their ballhandlers were. Leads changed, tension mounted, and the basketball was great. And if the Reluctant Baller didn’t see it, well, he missed something he would have really enjoyed, and maybe next year, the Irredeemable CoachDad remarks. Coach K now has five NCAA titles, separating himself still farther apart on the great coaching ladder. (Adolf Rupp, the man who made Kentucky basketball a national force, won four without ever having to betray his principles, such as they were, by having Negroes on his teams.) I’ve seen Krzyzewski at work in preseason practices in Durham, and I’m a fan. He’s a brilliant coach, obviously, and in the main I can separate my admiration for his skill, resilience, endurance and still-evident enthusiasm for the game. (It has to be stubbornness, pure and simple, that gets him out on the recruiting trail, a senior citizen courting highly sought-after teenaged boys.) He must still have the juice to prepare and lead high-quality practices, too, which is where the real discipline and stamina come in. Is Coach K a corporate shill? Yeah. Has he made compromises that he mightn’t have been able to imagine when he took over the Duke basketball program? Probably. It’s a corrupt business that he’s in, so it’s hard to come out of a mudfight without a few stains on your suit. Still, coaching is good, and he’s a great one, and is mainly to be admired. 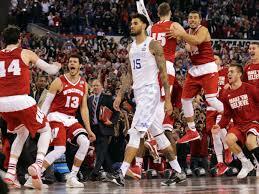 The “One Shining Moment” video is getting old for me, but not for Coach K and his boys. And it’s still a wonderful game. Stubbornness LIVES! I got it done. In April! (Well, nearly.) Lessee. Nearly 3000 words on a three-week old news story about college boys playing basketball for free (sort of) for millions on TV and sixty thousand paying huge money to barely be able to see the floor. Seems about right. And if you read this far, kudos. You’re about as stubborn as me.